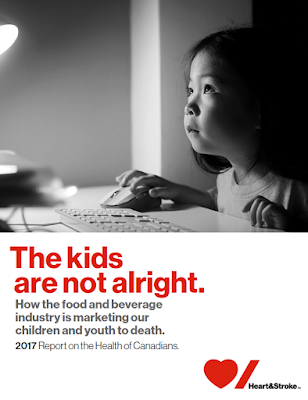 The Kids Are Not Alright - that's the blunt title of Canada's Heart and Stroke Foundation's (HSF) 2017 Report on the Health of Canadians, and it examines how Canada's food industry preys on our kids through marketing. According to the HSF's review, the average Canadian child watches 2 hours of television daily and sees 4-5 food and beverage ads per hour. But of course, televisions are not a child's only screen. To dive deeper, the HSF asked Dr. Monique Potvin Kent to review the advertising on the top 10 most popular websites for children and adolescents. She set out to determine the volume of ads aired there and even she was blown away by what she found. Those 10 websites together served up over 25 million food and beverage ads to children between the ages of 2-11, and 2.5 million to adolescents aged 12-17 (the lower number for the teens reflective of the fact there were less teens visiting the sites studied, not that the sites served up fewer ads) over just one year. While the most frequently advertised products for the most part weren't surprises (Pop Tarts, Frosted Flakes, Happy Meals and Lunchables), it was horrifying to me to learn that the 4th most frequently advertised product on the top 10 most popular web pages for 2-11 year old children was Red Bull Energy Drink (and it was the third most frequently advertised product to teens). And of course advertising works. That's why companies spend billions of dollars a year on it. But given the known impact of advertising on kids' preferences and consumption along with the rise in their rates of diet-related chronic diseases. 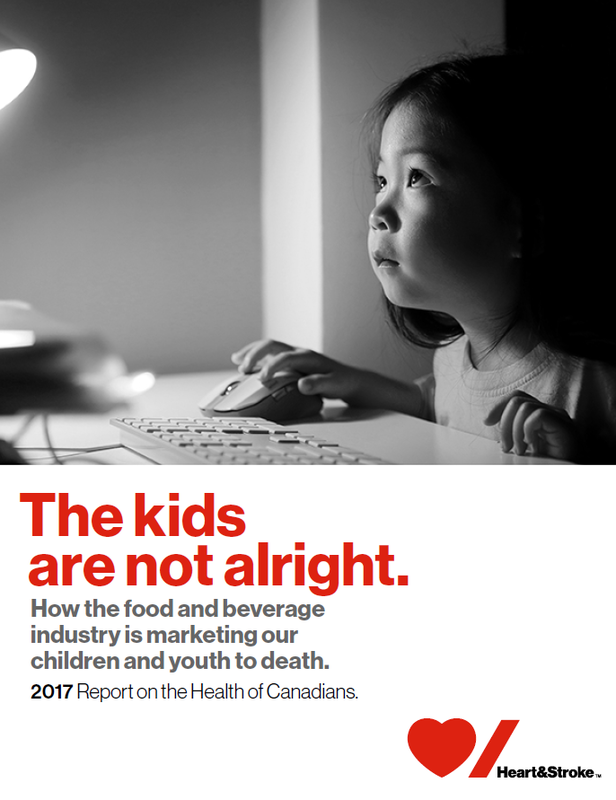 It's important to note that these findings come out of an environment where industry self-regulatory efforts exist (the Canadian Children's Food and Beverage Advertising Initiative or CAI), and that fact further strengthens the HSF's strong call for the legislated removal of food and beverage marketing to children in that Potvin Kent's web survey revealed that the worst corporate offenders were CAI participants. The well worth a read report ends with a series of expanding recommendations about what we can do as individuals and parents, what the various levels of government can do, what schools and school boards can do, as well as communities, health organizations and of course, what the food industry can do - though I'm willing to wager that without legislation it's not particularly likely that they will follow the HSF's recommendation to simply stop marketing foods and beverages to kids.